ISLAMABAD: The federal government would pay a whopping Rs3.6 trillion on account of defence and debt servicing that is equal to 68.2% of the current fiscal year’s revised budget, the centre on Wednesday sensitised the provinces about the grave fiscal situation that has thrown the country into a debt trap. After excluding debt servicing and defence related obligations, the net federal revenues for fiscal year 2018-19 are negative Rs632 billion, Federal Secretary Finance Arif Ahmad Khan briefed the four provinces during the first meeting of the ninth National Finance Commission (NFC). The NFC meeting included a detailed presentation by the federal finance secretary, focusing on the country’s overall current fiscal position. The federal government’s total gross revenues are estimated at Rs5.5 trillion. Out of this sum, the provinces will get Rs2.581 trillion as their share in the federal divisible pool. This leaves the net federal revenues at Rs3 trillion but the cumulative spending on just two heads – debt and defence – is Rs3.62 trillion. Since the debt and defence spending are equal to 121% of the net federal revenues, the finance ministry borrows to pay salaries, pensions, run hospitals, schools and build roads. Every penny that the centre spends on development is borrowed from the banks and foreign lenders. Compared with negative Rs632-billion revenue of the federal government, the net revenue, after excluding interest payments of the provinces, is positive Rs583 billion for this fiscal year. Under the existing constitutional arrangement, defence is the responsibility of the centre. Against the stated defence budget of Rs1.1 trillion, the finance ministry told the NFC that by the end of fiscal year 2019, Rs1.676 trillion would be spent on defence that is equal to 31.5% of the federal budget. This is the second biggest charge on the budget after debt servicing. The Rs1.676-trillion defence expenditures are inclusive of pensions, strategic nature expenses and special military packages, according to the finance ministry’s presentation. Similarly, against Rs1.842-trillion budgeted cost of debt servicing, the finance ministry told the provinces that the debt servicing would consume minimum Rs1.95 trillion, or 36.6%, of the total budget. The central bank’s decision to increase interest rates also put additional burden of roughly Rs500 billion on the finance ministry due to high cost of borrowing. The cumulative spending on these debt and defence has been projected at Rs3.621 trillion, or 68.2%, of the budget by the finance ministry. Such an alarming situation of the federal fiscal operations showed that the centre was not in a position to surrender any amount out of its 42.5% share in the federal divisible pool. But the provinces want to increase their pie. The finance ministry has projected the size of the budget at Rs5.38 trillion for this fiscal year and showed the federal fiscal deficit at Rs2.4 trillion or 6.3% of GDP. 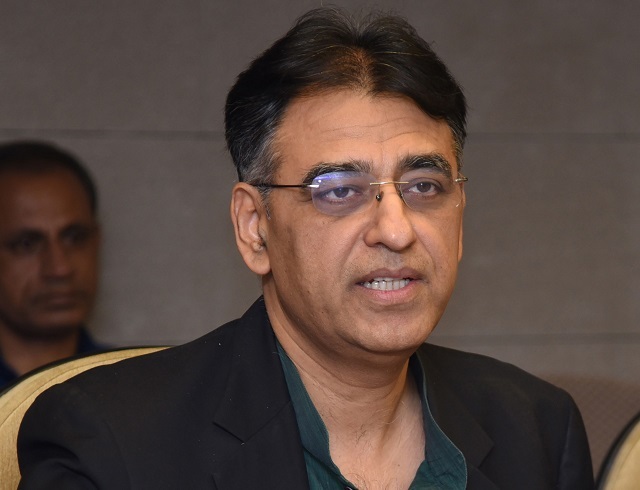 “Until resources are increased, neither the provinces nor the centre can achieve its targets,” said Finance Minister Asad Umar after the NFC meeting. Punjab’s technical member NFC Dr Salman Shah said the overall debt has increased to Rs30 trillion and this carried huge implications for the federal government as someone has to finance it. The finance ministry took a position in the NFC that the fiscal sustainability was at the heart of the economic and social management. It was of the view that imprudent fiscal management led to worsening external account, unsustainable economic growth and increase in prices and accumulation of debt. In its presentation, the Ministry of Finance projected the FBR’s revenues at Rs4.417 trillion while the other revenues were shown at Rs1.15 trillion. The gross revenue receipts that were equal to 12.1% of GDP in 2012 have now increased to Rs14.8% of GDP. But the stick and inelasticity in expenditures, like defence and debt servicing, kept the budget deficit towards the higher end. The total federal expenditures that were Rs3 trillion or equal to 15.2% of GDP in 2012 have now increased to Rs5.4 trillion. The high debt and defence servicing adversely impacted the federal development spending that was Rs317 billion, or 1.6%, of GDP in 2012 will now go down to 1.5% of GDP at the end of this fiscal year. In absolute terms, the finance ministry has projected the federal development spending at Rs575 billion in this fiscal year. Total gross revenues of the four provinces have been projected at only Rs654 billion in this fiscal year. The four provinces have been projected to pay Rs71 billion in interest payments, leaving their net revenues, excluding interest payments at Rs583 billion. But Sindh Chief Minister Murad Ali Shah on Wednesday blamed the FBR for this poor fiscal performance. He was of the view that the provinces showed 26% growth in collection of sales tax on services during the past five years, which was double the growth rate in collection of sales tax on goods by the FBR.